Welcome back to my 3-part series on how to make pho! In part 1 we learned to make a Saigon-style pho. In part 2, it was a Hanoi-style pho. And today, for part 3, we’ll learn how to make a chicken pho. Chicken pho is a great alternative to Saigon and Hanoi pho (which are types of beef pho). This is especially true when you don’t have the time or inclination to make a long simmered beef broth. 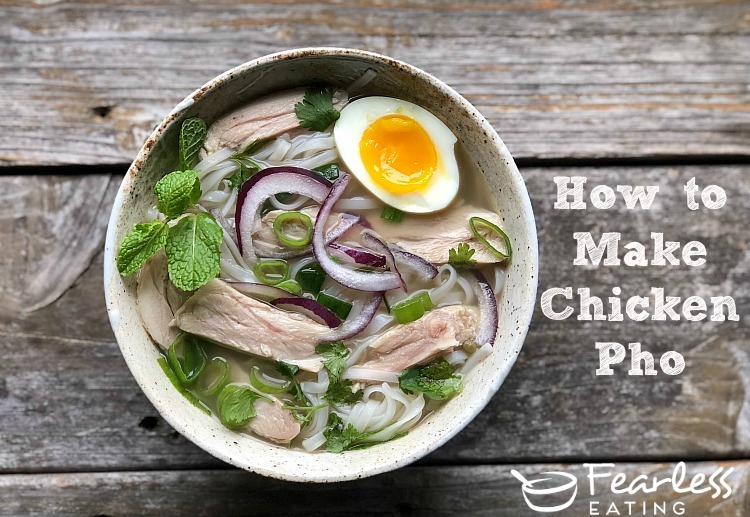 Another great reason to make chicken pho is that you can choose to make it in the Saigon style, with lots of seasonings and herbs, or, in the Hanoi style, which is all about the broth and contains fewer seasonings. If you read part 1 and part 2 you know which style of pho I prefer! 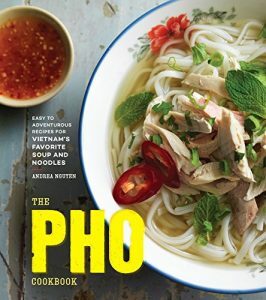 This entire 3-part series was inspired by The Pho Cookbook by Andrea Nguyen, a native of Vietnam. I’ve made a lot of faux pho recipes in the past, which take some shortcuts in the broth-making process, but Nguyen inspired me to go all out and make pho the way it’s traditionally made in Vietnam. Her book has 3 classic recipes called “old school stunners” which I’ve re-created for this series, adapting each one to suit my own tastes and my own creative instincts. 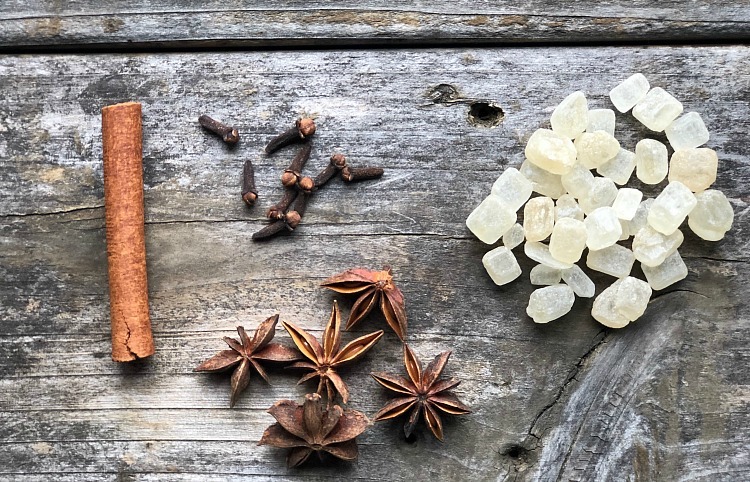 All three emphasize REAL bone broth, slowly simmered with all the spices, herbs, charred ginger and onion to bring out some incredible flavors. There are 11 steps to make chicken pho. However, just like with Saigon pho and Hanoi pho, the key is the broth. In the case of chicken pho, that would be the first 6 steps. Once you get those first six steps down, everything else is a piece of cake. Step 1. Prepare your chicken broth. For the recipe below we’ll be making about 4 quarts of chicken broth. To make four quarts you’ll want about 5-6 pounds of chicken. Make sure to use some meaty parts like thighs, legs and even breasts. You can use either a whole chicken (about 3-4 pounds) and/or a bunch of chicken parts. Add in some gelatinous parts if you can like wings, backs, necks, feet and leftover bones for a more nutrient-dense broth. Put everything in a good sized stock pot (at least 8 quarts) and cover with about 4-5 quarts of cold, filtered water. Make sure all the parts are submerged in the water. Bring the water to a boil and skim any scum that comes to the surface in the minutes before the water boils. Upon boiling, turn the heat down to a gentle simmer and cover. Make sure the broth continues to simmer gently when the cover is put on the stockpot. You may have to turn down the heat quite low for this. You’ll want 1 large onion or 2-3 large shallots and about a four inch piece of ginger. For a review of how to do this and the different options available (which depend on your stove and grill situation) please see part 1 for a Saigon-style pho. Once charred, remove from the heat and let it cool a few minutes. Peel or slice away all the charred skin and blackened pieces and add to the simmering chicken broth. That would be 1 cinnamon stick, 4-5 whole star anise, 6-7 whole cloves and about a half ounce of rock sugar. I thought this made a significant difference. Add them all to the simmering broth. Step 4. After about 30-40 minutes remove the meaty parts from the broth. They should be cooked through. If you’re using a whole chicken, remove the whole thing and let it cool for a bit. Keep the broth gently simmering. Slice or pull the meaty parts from the whole chicken (thighs, legs, etc.) and keep them reserved until the broth is done. Keep them as whole as possible to keep them tender. We’ll be using the chicken meat from these parts when assembling the bowls in the final steps. Step 5. Return the carcass to the broth and continue simmering for 1-2 more hours. Taste the broth after an hour. If should have a nice chickeny flavor. If it lacks flavor, simmer with the cover off to cook the broth down a bit to condense the flavors. You can simmer it beyond a few hours if necessary. However, be careful not to condense it too much otherwise you’ll lose a lot of the broth to evaporation! Step 6. Strain the broth and add fish sauce, to taste. When the broth is ready, cut the heat and let it sit for about 20 minutes. Strain it through a fine mesh strainer and/or fine mesh cheesecloth. Season with 2 TBSPs of fish sauce. Taste and add 1 TBSP more at a time, to taste. About 4 TBSPs total gives it a nice saltiness but you might like a little more or less. Keep in mind that you can always add more fish sauce to individual servings. If you’re making this for a group of people (especially those not familiar with the taste of pho), better to err on the side of catuion and add less fish sauce. Slice the chicken off the bone of the reserved meaty parts and slice into small bite-sized chunks and pieces. You can keep the smaller on-the-bone parts like thighs, wings and small drumsticks intact. Whole chicken parts in soup is not uncommon in Asia! Best to do this while the broth is resting. Use standard medium-sized flat rice noodles (which look like fettucini). Most health food stores now carry them in dried form though if you can find freshly prepared rice noodles in an Asian market, that would be even better. Here’s the brand of dried rice noodles I used. Step 9. Prepare some soft-boiled chicken or duck eggs. This is totally optional but I thought it worked great. It’s hard to go wrong with soft-boiled eggs (especially duck eggs) in Asian soups! Here’s where you have a lot of choice. For a chicken pho in the Saigon-style, you can add hoisin sauce, sriracha, fish sauce, bean sprouts, mint, Thai basil and cilantro. But I’d caution you against that. As I stated in part 2 for a Hanoi-style pho, sometimes less is more. And I’ve come to really love a more simplified style of pho. In the case of this chicken pho, I’d recommend some different garnishes and seasonings. First, try some thinly sliced red onions. Nguyen recommend soaking then in water for 10 minutes to soften their sharp bite but I’ll go one step further and recommend some lacto-fermented red onions. 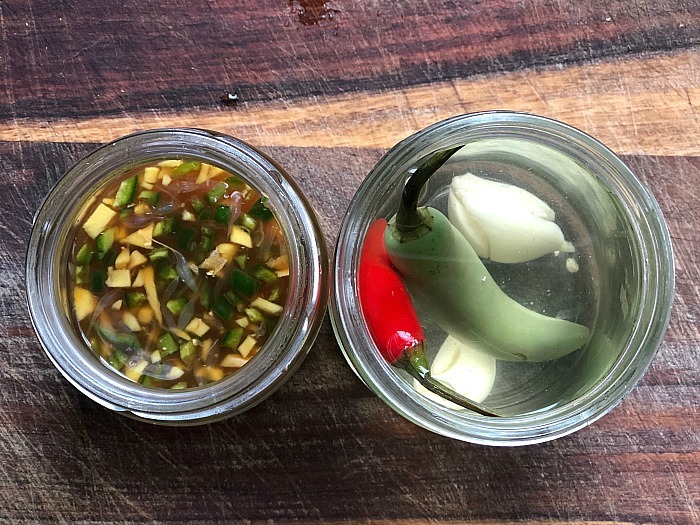 The one on the right is a simple homemade garlic vinegar which I made in the Hanoi pho post. It adds some wonderful sour and spicy notes to the broth. The one on the left is a sweet and sour homemade ginger dipping sauce which Nguyen recommended specifically for chicken pho. To make it, finely chop about 2 TBSPs of fresh ginger and add the juice of 1 lime, 1 TBSP coconut sugar, 2 TBSPs fish sauce and finely chopped jalapeno or serrano chile. Mix well, taste and adjust the flavors with more of each to your liking. The garlic vinegar can be spooned right into the soup while the ginger sauce is more of a dipping sauce for individual pieces of chicken. It could be too powerful if added directly to the soup! Finally, for the herbs, keep it minimal. Nguyen recommends just using cilantro and green onions but if you really love mint and Thai basil, you can add a little of those too. Step 11. Put it all together. Place a handful of rice noodles in individual serving bowls, followed by a spoonful or two of chicken meat and pour in the hot broth. You might have to re-heat the broth if it’s cooled a bit after straining. Add additional fish sauce, garlic vinegar, the herbs and red and/or green onions, to taste. Add a soft-boiled egg or two (optional). Serve with the ginger dipping sauce on the side. 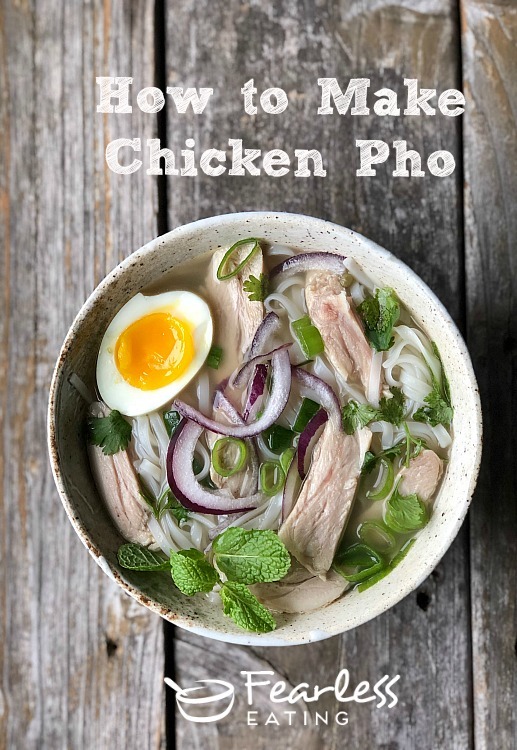 Chicken pho is made with a slowly simmered chicken broth and the classic pho spices. This recipe is modeled after a Hanoi-style pho which uses minimal garnishes and seasonings. It's all about the broth! Place whole chicken and/or chicken parts in a good sized stock pot (at least 8 quarts) and cover with about 4-5 quarts of cold, filtered water. Make sure all the parts are submerged in the water. Cut the onion or shallots in half. Slice unpeeled ginger in half lengthwise. 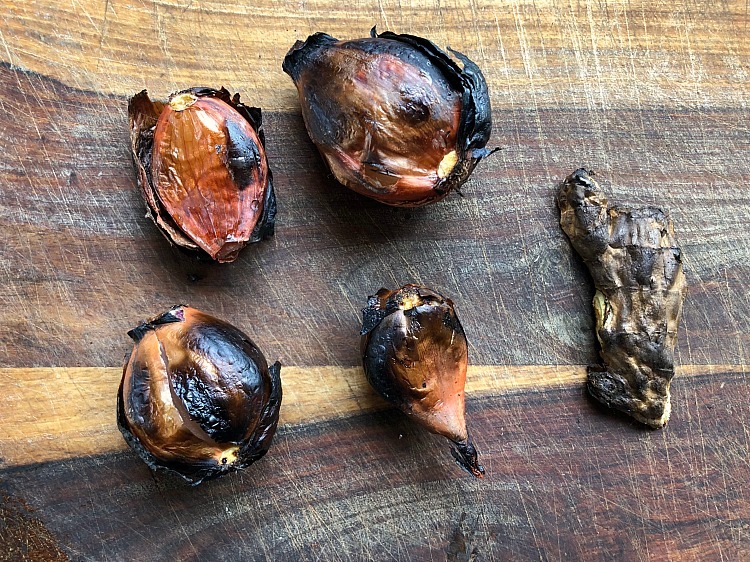 Char ginger and onion on a grill, gas stovetop or by broiling in the oven. Watch closely, turn on occasion and remove from the oven after about 10-15 minutes. Once charred, remove from the heat for a few minutes to let them cool. Remove the outer skin from the onion/shallots and peel the ginger. Remove any blackened pieces and add them to the beef broth. Add the cinnamon, star anise, cloves and rock sugar to the broth. Cover and keep the broth gently simmering. After the chicken cooks for about 30-40 minutes, remove the meaty parts from the broth. They should be cooked through. If you're using a whole chicken, remove the whole thing and let it cool for a bit. Keep the broth gently simmering. Slice or pull the meaty parts from the whole chicken (thighs, legs, etc.) and keep them reserved until the broth is done. Don't slice the parts yet. Keep them as whole as possible to keep them tender. Return the carcass and/or bones with meat removed to the broth and continue simmering for 1-2 more hours. Taste the broth after an hour. If should have a nice chickeny flavor. If it lacks flavor, simmer with the cover off to cook the broth down a bit to condense the flavors. You can simmer it beyond a few hours if necessary. However, be careful not to condense it too much otherwise you'll lose a lot of the broth to evaporation! Season with 2 TBSPs of fish sauce. Taste and add 1 TBSP more at a time, to taste. About 4 TBSPs total gives it a nice saltiness but you might like a little more or less. Keep in mind that you can always add more fish sauce to individual servings. Prepare the chicken. Slice the chicken off the bone of the reserved meaty parts and slice into small bite-sized chunks and pieces. You can keep the smaller on-the-bone parts like thighs, wings and small drumsticks intact if you want. Prepare the rice noodles. Do this while the broth is cooling. Use standard medium-sized flat rice noodles (which look like fettucini). Most health food stores now carry them in dried form though if you can find freshly prepared rice noodles in an Asian market, that would be even better. Prepare some soft-boiled chicken or duck eggs. This is totally optional. Prepare the garnishes and seasonings. See the directions in the blog post above for all the choices. Put it all together. Place a handful of rice noodles in individual serving bowls, followed by a spoonful or two chicken meat and pour in the hot broth. You might have to re-heat the broth if it's cooled a bit after straining. Add additional fish sauce, garlic vinegar, the herbs and red and/or green onions, to taste. Add a soft-boiled egg or two. Serve with the ginger dipping sauce on the side.